Demonstrating another reason to use only 100% synthetic based oils. AMSOIL Inc. is about the only manufacturer making these available via the general retail market. AMSOIL Signature Series will prevent severe damage when the below published issues appear. Be sure to follow the recommendations below because the problem is caused by combustion gasses which this amount quickly forms soot or particulates, but regardless you need an oil impervious to the contaminants. AMSOIL’s detergents and other additives buy you more time while preventing normal wear which occurs before the problem develops. Not only that but a high performance engine as these deserve to deliver maximum performance and the AMSOIL Signature Series does just that! OBJECTIVE: Communicate revised AMSOIL motor oil and filter drain interval recommendations for turbocharger-equipped Subaru engines. The revised recommendations were initiated in response to the Subaru Service Bulletins on the subject. ISSUES: Subaru published Service Bulletin #02-103-07 on October 19, 2007 identifying a problem with the oil delivery systems on turbocharged vehicles. The mesh screen (located inside the banjo bolt) that filters the oil can become prematurely clogged. The Subaru solution is decreasing the oil and filter change interval by half to 3,750 miles (6,000 km) or 3 3/4 months, and inspecting the screen and oil supply pipe at every oil change. Failure to clear, clean or replace a clogged mesh screen results in oil starvation and a failed turbocharger. Subaru has since published Service Bulletin #02-110-10R indicating that 2010 MY and prior turbocharged engines continue to require oil and filter change intervals of 3,750 miles (6,000 km) or 3 3/4 months, while all 2011 MY turbo- charged engines have returned to the original requirement of 7,500 miles (12,000 km) or 7 1/2 months, and they are required to use synthetic oil . TECHNICAL DISCUSSION: This mechanical problem is not being linked to lubricant performance, and the only solution at this time is to inspect the screen more often. A published service bulletin from Forced Performance aftermarket turbo company recommends removing the screen , but telephone discussions with Subaru representatives indicate the company advises against individual owners removing the screens. According to the Subaru bulletin, the problem appears to be compounded when vehicles are operated under severe driving conditions, such as moderate to hard acceleration and engine braking on a somewhat regular basis. Under severe conditions, the engine oil is consumed more quickly due to high intake manifold vacuum. Subaru recommends the oil be checked at every fuel fi ll-up. Forced Performance turbo company reported in one case a 2005 Baja with regular 3,000-mile oil changes still exhibited this problem. RECOMMENDATION: AMSOIL synthetic motor oils present the best defense against the potential problems outlined in this document. Their high levels of detergents and dispersants help keep small particles in suspension and help minimize screen clogging, but will not prevent clogging if the particles are too large. Due to the issues outlined in this document, AMSOIL recommends following Subaru drain interval recommendations. For 2010 MY and prior turbocharged Subaru vehicles, change the oil and filter every 3,750 miles (6,000 km) or 3 3/4 months. For 2011 MY and newer turbocharged Subaru vehicles, change the oil and filter every 7,500 miles (12,000 km) or 7 1/2 months. 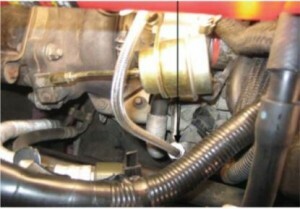 The screen and oil supply pipe for the turbocharger must also be inspected at every oil change. As always, keep track of maintenance records. In the event of a turbo failure, it will be necessary to provide this information for Subaru to honor the warranty.